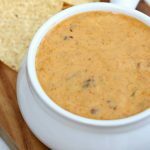 You just can’t go wrong with a 3 ingredient Chili Queso Dip! The best appetizer for every occasion. Add all ingredients to slow cooker. Cook on low for 4-6 hours.